Which Notre Dame treasures survived the fire? As evening fell on Paris last night, the massive fire burning atop Notre Dame Cathedral lit up the darkening sky and drew shocked stares from around the city and the world. The Gothic structure, one of the most popular attractions in France, was undergoing a $6.8 million renovation when it caught fire around 6 p.m.
By the end of the day, the spire of the church had collapsed, the roof was destroyed, heavy smoke billowed from the structure, but the worst had not come to pass: The main structure including the two bell towers would survive. 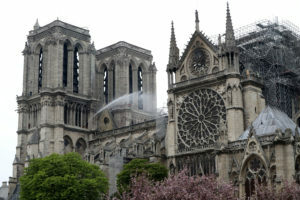 Though grievous damage has forever altered the 856-year-old cathedral, French government officials say that the precious relics housed inside were spared from the fire. French President Emmanuel Macron said today that he wants the iconic Catholic landmark rebuilt within five years, although experts estimate it could take decades. 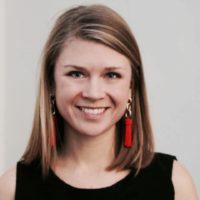 Institutions like the United Nations and the American University of Notre Dame have pledged their help to the effort. Here’s what we know about the state of Notre Dame’s best-known religious artifacts and works of art after yesterday’s fire. In the 13th century, King Louis IX (also known as Saint Louis) spent an immense amount of money to purchase a series of relics said to come from the final 36 hours before Jesus died, known as the passion. Lev noted that Louix IX spent less money on constructing the chapel in which they were stored — the Sainte-Chapelle — than he did on the actual relics. 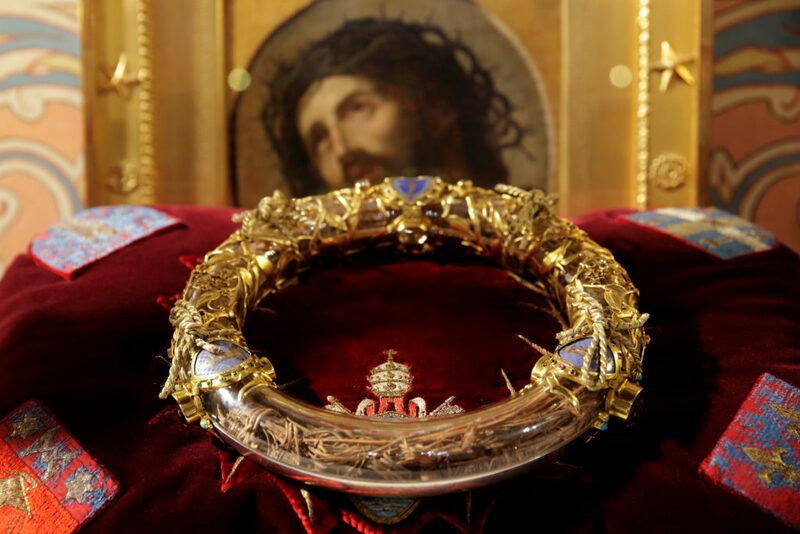 Today, French Minister of Culture Franck Riester confirmed that some of Notre Dame’s most precious relics had been saved, including the crown of thorns that Jesus is said to have worn, a wooden part of the cross on which he died, as well as the tunic of Saint Louis himself. Lev said the crown of thorns is particularly significant to Christians, as it is still taken out on the first Friday of every month for people to come see. Such a practice, said Lev, “is a way for people to share in that memory of this extraordinary example of humility.” The fact that it is Holy Week, with Good Friday approaching, added Lev, made it all the more important to get it out of the cathedral. 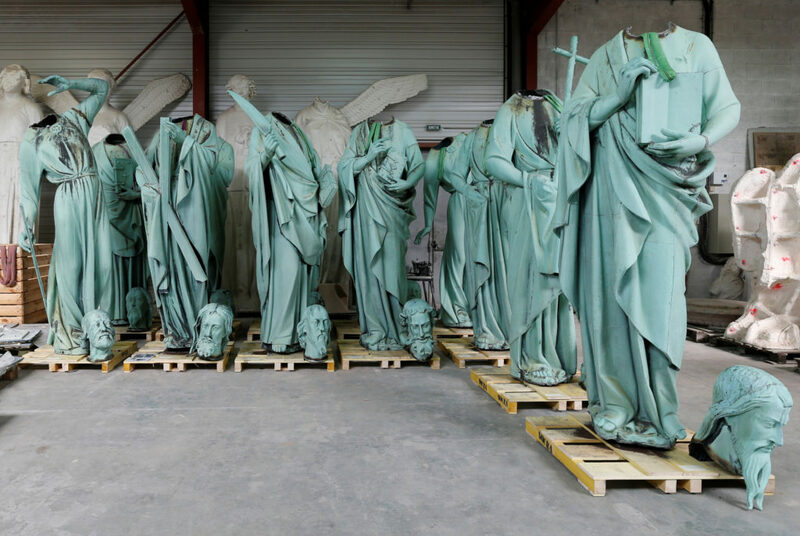 The statues representing the 12 apostles and four evangelists that once graced the top of the cathedral were actually removed last week as part of the restoration efforts. They are currently stored in Périgueux, in southwestern France, and were thus not harmed in the fire. 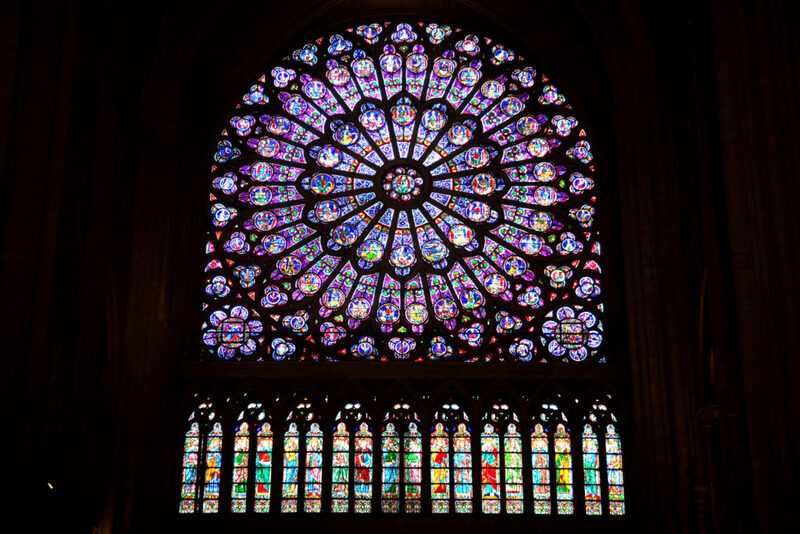 The circular stained glass windows, or “rose windows,” are one of the most prized parts of Notre Dame. The Archbishop of Paris confirmed to BFM-TV today that these 12th- and 13th-century works of art had not been damaged by the fire. Lev noted that smoke from the fire would probably stain and damage the glass. But “what is really amazing, is how much of these windows are actually still there,” she said. The windows have survived several dark and violent periods in France’s history, including the Paris Commune of 1871, when Notre Dame was threatened by left-wing revolutionaries, a bomb strike during World War I, when the Germans targeted the church, not to mention the German occupation during World War II. 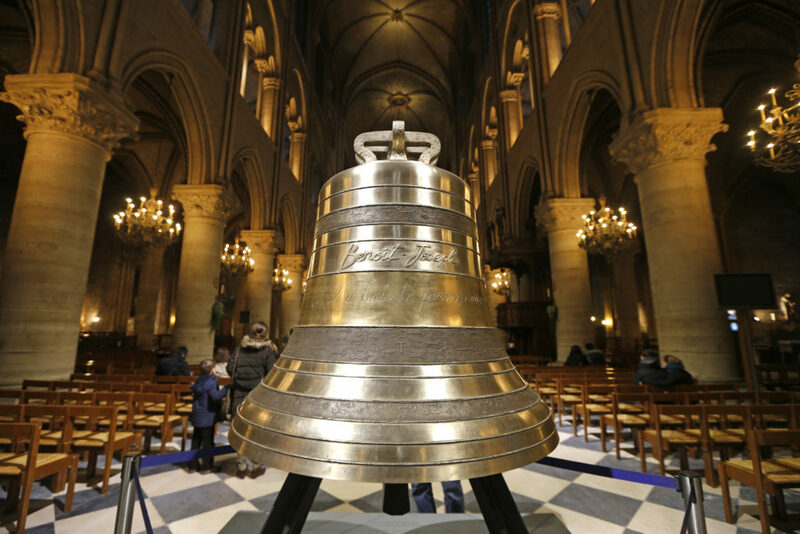 The iconic bells of the cathedral — immortalized in the classic Victor Hugo novel “The Hunchback of Notre Dame” — have not been harmed, nor the pipe organ, BFM-TV also confirmed. The bells — each one named after a saint — have undergone their own rebirth, and more than once. In 2012, they were melted down and recast to restore their tones after growing discordant. The ones they replaced weren’t the originals, either — they had been installed in 1856 after the French Revolution had deprived the church of its valuable metal bells to make a cannon. 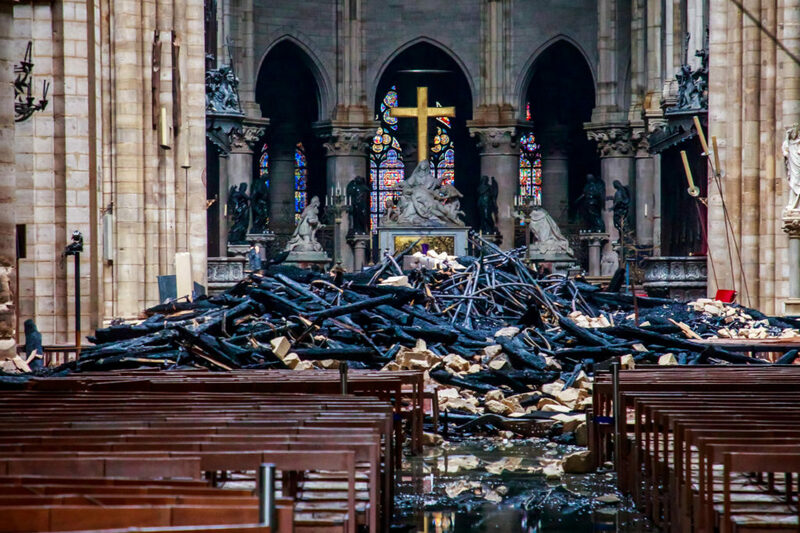 While the full extent of damage to the church’s artwork and artifacts can’t yet be evaluated, the structural losses to the cathedral itself stand out as a devastating casualty. “It was something that was really spectacular,” said Laurent Ferri, a curator in the Division of Rare and Manuscript Collections at Cornell University, who noted that the 12th-century oak framing was called “the forest” for the immense volume of wood that it encompassed. Wooden remnants of the devastated frame littered the interior of the church in photos published today. Going forward, the big question for those restorating the cathedral is exactly which period of its architecture they wish to evoke, Ferri said. Since its construction began in 1160, the church has gone through a number of renovations and restorations. During the latest restoration, which was led by Eugène Viollet-le-Duc between 1844 and 1864, the now-incinerated spire was installed.